A remote server with a database table, which in turn consists of the table definition (stored in the MySQL data dictionary) and the associated table. The table type of the remote table may be any type supported by the remote mysqld server, including MyISAM or InnoDB. A local server with a database table, where the table definition matches that of the corresponding table on the remote server. The table definition is stored in the data dictionary. There is no data file on the local server. Instead, the table definition includes a connection string that points to the remote table. 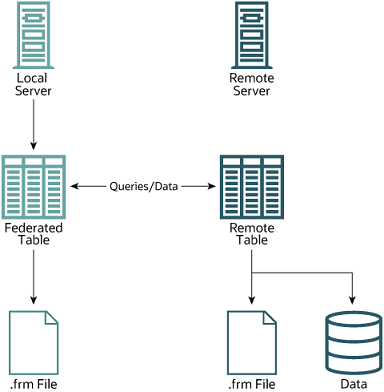 The basic structure of a FEDERATED table setup is shown in Figure 16.2, “FEDERATED Table Structure”. In short, it's really cool to have the shared tables between projects, for example, Geo data: cities with coordinates, IP-to-city mapping, etc.